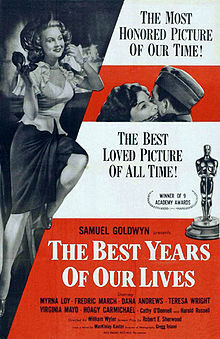 The Best Years of Our Lives (1946): Dir. William Wyler. Written by: Robert E. Sherwood. Based upon the novella Glory for Me by MacKinlay Kantor. Starring: Fredric March, Dana Stevens, Harold Russell, Myrna Loy, and Teresa Wright. Unrated. Running time: 172 minutes. William Wyler’s exposé of World War II veterans premiered right as America was struggling to adjust to post-war life. As such, the film’s and the audience’s mindsets matched perfectly, which may explain why the film went on to gross the highest box-office profit since Gone with the Wind. Following the lives of three recently arrived servicemen to the fictional town of Boone City, the film details the difficult transition from soldiers to working civilians. Fred, Al, and Homer each served their country with distinction, but that means seeming little for them at home—their families and businesses have not stopped changing during the war. Hardship besets them as they try to assimilate back into American life. Like his previous film Mrs. Miniver, Wyler aims to show the lives of ordinary folk when affected by adversity. Unfortunately, it also means his characters fall into the same trap as that film— generic characterization. That said, we do see flashes of individuality that maintain our interest—Fredric March gives a solidly entertaining performance as Al, particularly in his alcohol-drenched sequences. Harold Russell also does well as Homer, struggling physically and psychologically to adjust to the hooks which have replaced his amputated hands. The film also suffers from excessive sentiment: not only from an overpowering score, but from a heavy-handed script and lingering close-ups on family members. But Wyler does make us see the awkward transitions for all three characters, and we can understand their predicament. To fight for one’s country and to be treated as an inexperienced workman must have been infuriating. The best moments of the film explore human trauma through imagery and cinematography. If only Wyler and company had aimed for more realism and ditched the tidy ending, Best Years might have deserved the lasting impact it has today.